The term "Generation X-ray" refers to youth addicted to communicating and recreating with wireless devices - cell phones, PDAs, WiFi computers and music/gaming equipment. These wireless devices emit high-frequency microwave radiation, recently demonstrated by European researchers to efficiently inflict the same horrific damage on human cells as X-radiation. For the sake of human survival, mankind must quickly master this critical fact: modern wireless technology is capable of causing the genetic destruction of humans as a species. 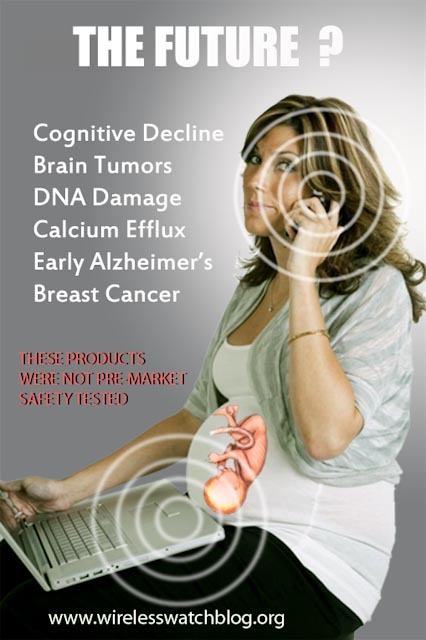 Microwave radiation used for wireless communications and surveillance is extremely injurious to human DNA. It is therefore also destructive to both the human genome and the epigenetic chemical switches which control expression of the genes. Below is visual proof, as determined by the **REFLEX** studies, published in 2004 by the European Commission. - Slide one (top left) shows a normal healthy cell under magnification. This cell is a bright energetic little orb with its DNA and other genetic materials safely inside the cell membrane. It represents the cells of healthy, non-irradiated children of generations past. - Slide two (top right) shows a living cell exposed to 1600 chest X-rays. This cell is shrunken and has lost its energetic brightness. Trailing behind it are its genetic guts, spilling through the cell membrane as little particles that look like a comet trail against the dark background. These DNA fragments are called micronuclei, typical mutations from excessive X-rays, or from gamma waves of nuclear detonation. - Slide three (bottom) shows a cell exposed to 24 hours of cell phone radiation. This cell's comet tail of micronuclei splat is identical to that of ionizing X-ray damage. The microwave frequency used by REFLEX scientists to micronucleate this cell was 1.8 gigahertz (1800 megahertz), comparable to 1.9 gigahertz frequency blasting from both personal wireless communications devices and the base stations which service them. The Russians targeted the U.S. embassy with 2.4 to 4.1 gigahertz, a range within the same realm of frequencies blasting from America's wireless cell phones, in-house cordless phones, wireless computers, WiFi systems and cell towers. The Russians mainly used a power density of around 5 to 18 microwatts per square centimeter (5-18 uW/cm2).